Justice Served. 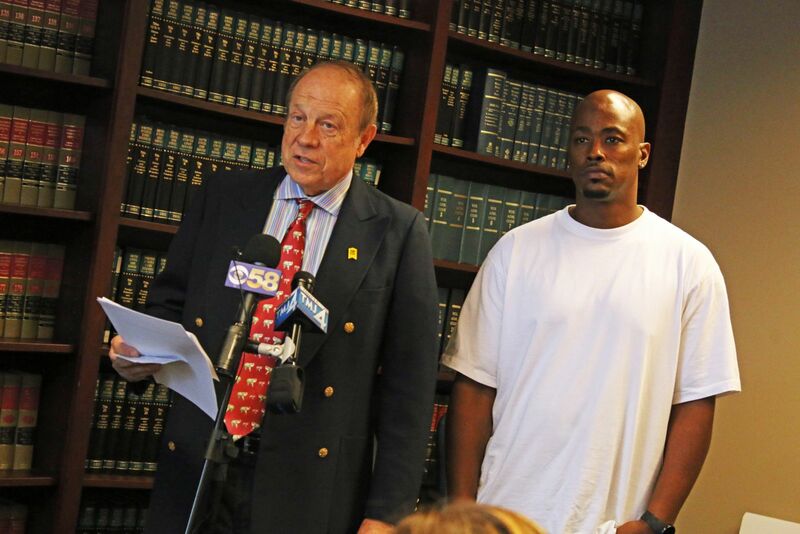 $25,000 Rewarded To Informant | Hupy and Abraham, S.C.
Attorney Hupy addressing the media with informant Antoine Buchanan by his side. UPDATE OCTOBER 22: Divonte Forbes, the man that provided the guns used in the shooting, has been sentenced to an 11-year term. The other convicted participants are set to be sentenced in December 2016. On October 19, 2016, Hupy and Abraham, S.C. President Michael Hupy personally gave the informant in the Laylah Petersen case a cash reward of $25,000 due to the arrest and conviction of those behind the shooting. On November 6, 2014, the 5-year old was fatally shot on Milwaukee’s northwest side, while sitting on her grandfather’s lap in his living room. Initially, the Milwaukee Police Department had difficulty making progress with the case. As a way to encourage the public to assist with information regarding the shooting, Attorney Hupy pledged to give a cash reward to the first person to come forward. The informant identified Carl Barrett Jr. and Gordon Arlis as shooters in the case, as well as Paul Farr, who drove the getaway car. Additionally, the informant wore a wire to ID the man that sold guns to Arlis and Barrett. This information led to a conviction of all three. This is the not the first time Attorney Hupy has made similar offers in an effort to obtain justice. In May 2016, he announced a $50,000 reward for information after nine-year-old Za'layia Jenkins was shot in the face from a stray bullet while she was watching TV in her home, which resulted in her death. Additionally, Attorney Hupy announced a reward after 10-year-old Alfredo Bautista was struck in the thigh by a bullet while sleeping in his bed near 20th and Lapham.